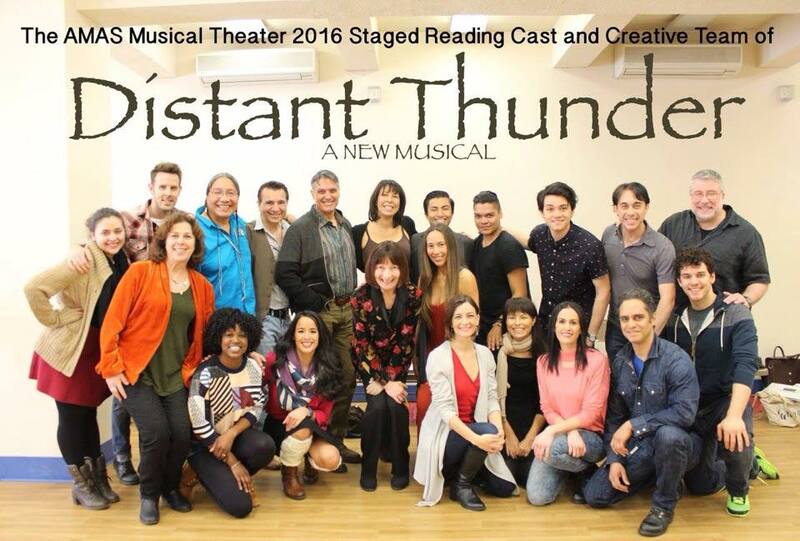 After a solid week of inspired work, the cast and creative team behind the new Native American musical Distant Thunder presented industry readings to packed audiences at Pearl Studios, NYC. Produced by Amas Musical Theatre and Donna Trinkoff, the readings were a great success! The response was overwhelming. Even from my view as a relative newcomer to the project, the positive energy and sense of accomplishment was palpable. To see representatives of different tribes from across the nation visit NYC, to witness a story holding a perspective rarely acknowledged in mainstream art, was moving. I am honored to have been included in this latest rendition. That’s often expressed in this business, and easily cliched (#soblessed) — but when you are touched by a story that you have no personal familial ties to, no obligation to, and are still moved… someone *cough* Shaun and Lynne Taylor-Corbett *cough* has uncovered a story with a truth and a voice. I hope to see the creative team continue development so audiences can receive the gift that is Distant Thunder. This entry was posted in Music, Producing, Theatre. Bookmark the permalink.